I woke up to the phone ringing. It was my parents calling to say goodbye. They were leaving my grandma's to head for home. I told them to drive safely since it was raining and it was supposed to sleet and snow later so I had some concerns. I walked out into our living/diningroom area and found the cat stand fallen into our Christmas tree again. Ornaments were scattered all over. I had intended on leaving everything out and up until the morning of the first since we were hosting a small New Year's gathering and I wanted it to look festive. However, I wasn't about to put all the scattered ornaments back so I just went to our storage room to get the boxes to put everything away. It took a long time but I had Pinky to keep me company. Once everything was put away, I went to the local grocery store to get snackies for our gathering. It was raining pretty hard and I joked with a fellow in the store that though it was nice to have a warmer winter, I missed the snow. He said he missed the light and wished there was such a thing as global lightening. I got back to the apartment in time to say goodbye to Bob as he headed off to the store. Then I got to work cleaning our apartment. Pinky proved to be good company during all but the vacuuming. As I was cleaning, I looked out the window to see the scene pictured in the photo above. 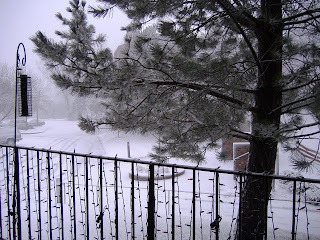 The rain had turned to snow. Once our pad was spick and span, I set to work laying out the snack buffet for our guests. I actually worried if the roads might be too trecherous for the people coming to our place. 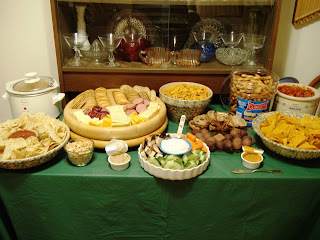 This is a photo of the snackies all laid out for tasting. Yum! I had corn chips with a hot queso dip, cheese, crackers, and summer sausage, cashews, veggies and dip, party mix, meatballs, truffles, Dad's banana bread, pretzels and mustard, taco chips, and regular potato chips. We also served a bunch of cold sodas and a nice white wine for later. The first set of our friends showed up around 7. We sat around and chatted while we waited for Bob to get back from the store and for our second group of friends. While we waiting, our friends called to say they were on their way. Not 30 minutes later, they called again to say they had only gone about 4 miles and passed 3 ditched cars. They were turning around and going back home. We were all disappointed but wanted our friends' safety more than anything. The rest of the night was spent chatting, watching football, eating snacks, and having good fellowship. One weird thing happened. As we were all sitting talking in the living room, our front door opened as though someone were going to come in. I called out, "Hello?" but the door slammed shut and we could hear someone running out the exit door next to our place and down the stairs to the garage. Bob went out in the hall to see if he could see anything incriminating. He came back and said no one was there. After that, we kept our door locked. At midnight we toasted with some champagne, I cleaned up, and our friends left around 12:30. Bob and I were in bed by 1. Yeah, we party hard! We are hoping 2007 is a better year than 2006 was for us. It feels better to me, but you never know. I am thankful for my friends, family, and my wonderful husband. Without them I would not have made it through this past year. I am so thankful for their support and love. They really made my year. I hope I can do the same for them this year.